If there's one thing I learned from humans, it's that work is everything to us. It's what all politicians promise us. It's what family and friends complain about when the times are rough. It's seen as an opportunity to prove ourselves useful in an uncaring world. It pays for the video games we buy, games in which we then pretend to work a different job. 7 Billion Humans is work, but it's enjoyable work. It's like that meeting where you get to brainstorm a crazy-enough-that-it-might-work idea with people you don't hate, instead of that day you kept receiving emails because business people don't know what "Reply All" does. I think fellow sapiens will be into it. Of course, we're not reviewing humanity as a whole today. 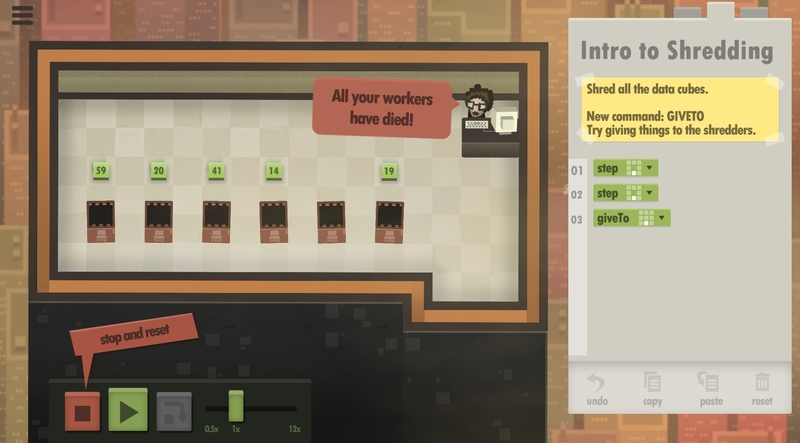 7 Billion Humans is instead a puzzle game based on coding principles. 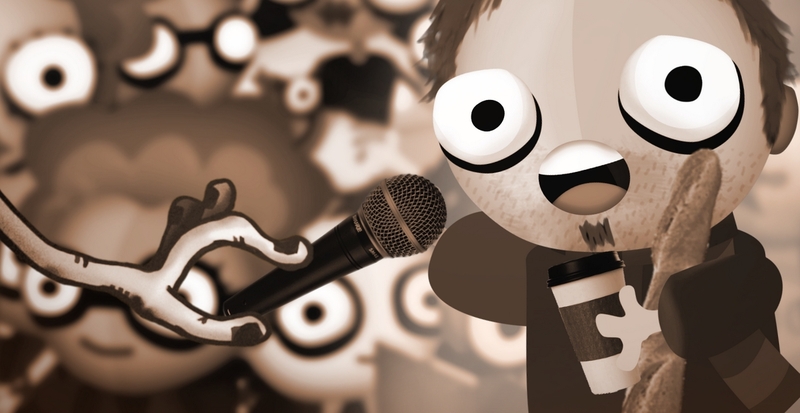 It follows Human Resource Machine, Tomorrow Corporation's previous game. Thankfully, it improves in a key area where the previous game struggled. The puzzles are much more appealing on their own, rather than as a simulacrum of coding. 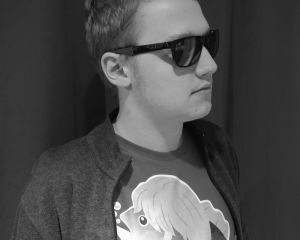 The basic gist of each level is to complete something that sounds easy at first. Arrange cubes on the floor into diagonals. Grab boxes and shred them. Navigate a maze and suicide in the right hole. The thing is, there are multiple people in the same room and they must all follow the same routine. Since the people here aren't particularly bright, they just have knowledge of the spaces directly adjacent to them and the nearest object of a certain type. The challenge comes from finding a solution to these simple problems that works for all participants at once. Sure, Humans is an allegory for multi-threading coding. But its puzzles are appealing thanks to the variety on offer and how concrete they feel without a necessary background in computer stuff. 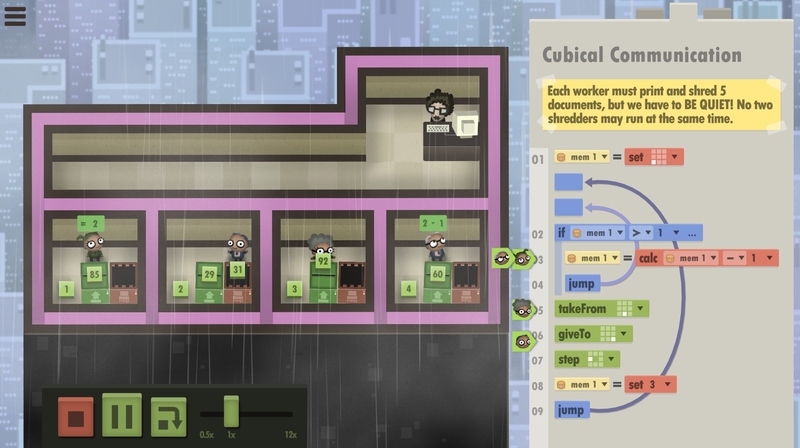 The cubes, shredders, printers, and even coworkers give you a lot of tools to complete puzzles in whichever way you choose, and the end result feels a lot more concrete -- despite being very random -- to any player than sorting a zero-terminated string. As I kept playing, I kept trying to "cheat" the game. What if I never used the "Talk To" command the game obviously wants me to use? Turns out that's perfectly doable. Playing outside the box isn't required, but it added a lot of fun to the game and sometimes shaved precious seconds off of the execution. That's great design! The presentation helps bring the whole game together as well. Buttons and commands are large and work as you'd expect. Being able to execute your commands step by step while focusing on a character's memory is very useful when debugging. The only issue I've encountered so far is when deleting chained conditions, it always deletes the one on the top instead of the one on the bottom. The top condition is the original one, that's the one I want to keep! If you're looking for something more than pure puzzle-solving, this is not the right game for you. The story in Humans is even more paper-thin than its predecessor. Machines have created a perfect utopia where nobody ever needs to work again, but the populace isn't happy. We want good-paying jobs. So random jobs are created and the whole planet's hired to complete them. That's basically all you get from start to finish in the dozen or so hours it takes to complete the game. As a side-note, it seems like a non-STEM student really hurt someone at Tomorrow Corporation. Despite how little story there is in Humans, we get a hipster barista, someone with a Ph.D. in medieval French literature getting dissed hard for having useless skills, and a tutorial level about adding numbers called "Intro to Calc for Art Majors". That's just rude, dudes. Don't have any illusions of becoming a master coder after finishing Humans. The limited flexibility of your commands and the overuse of jumps can lead to some ugly, ugly code. If you somehow get a real-life job right based on nothing but experience with this game, I'd expect a lot of years unlearning the patterns used here. The fundamental problem-solving skills used here are universal, thankfully. I could see this being useful to figure out if you're interested in the concept of coding, more than a tool to learn how to do it.